There is an expected increase in home remodeling due to the number of older adults that are in need of updated amenities. More and more baby boomers are choosing to stay at home. Adjusting these older homes for the aging requires some retrofitting to ensure a safe and comfortable environment. The right kind of improvements can help maintain freedom and dignity. So many memories are made at home and you shouldn’t have to settle for a remodel that feels sterile. There are lots of ways to increase safety without changing the feel of the home. A great place to start when making a home more functional for aging-in-place is a first floor full bathroom. This may seem costly but adding a chair lift or elevator tends to cost much more. We also receive requests for a first floor laundry room, which makes a lot of sense – heading to the basement and carrying laundry baskets upstairs becomes much more difficult. Make sure you get comfortable flooring in the kitchen. Tile, while easy to clean, is tough to stand on for extended amounts of time. Wood cork flooring, vinyl, linoleum, these will be a lot nicer to your joints. Another great addition is seated work spaces, that way you can still prep all your food while sitting down. One of the more obvious upgrades is a ramp leading to the entryway of the house. Eliminating stairs of any kind is always a good thing, allowing for groceries and other items to be wheeled right in. Keep the wheels rolling in the house; less carpeting is better, making for easy movement in the areas where it’s needed most. These are just a few things that can be done to allow for the aging to continue making memories where they’ve already made so many. If you know someone who doesn’t want to leave home but needs to upgrade soon for safety and comfort, we can talk through the options, so give us a call – 608-241-9009, or visit our Website adamsofmadison.com for more ideas! Remodeling your home is a big undertaking, whether it’s replacing a door, a new kitchen or bathroom, or adding on a new living space. Most people take several years to finally remodel, so you want everything to be just right. One of the latest design trends with kitchen remodeling is using white. White cabinetry, white countertops and even having white walls can help to create a very crisp, calming space. 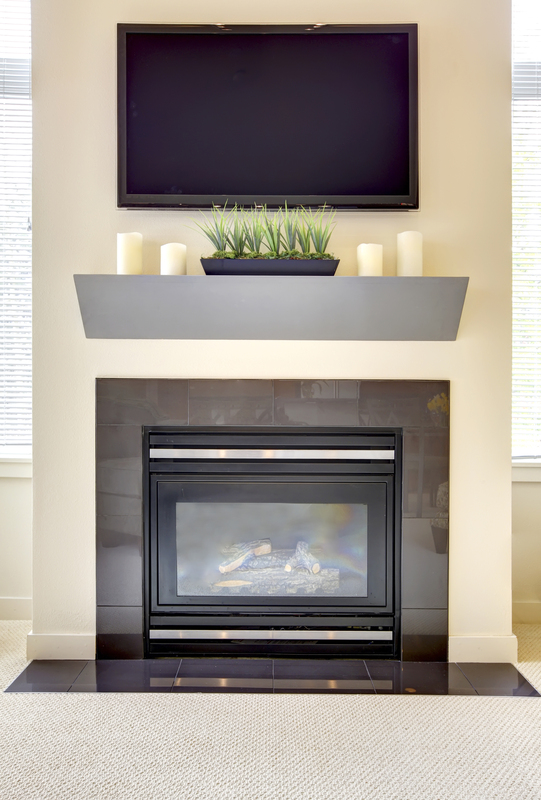 Adding touches of black into the design adds a layer of drama. Even if you do not go with a great deal of white, use it to help build contrast. It is a good idea to have that brilliant white background and then to use pops of contrasting color throughout the space. Another kitchen remodeling tip for those who want to be trendy is to use pieces within the space that create more drama and excitement. Place something unexpected into the room. For example, you may want to use oversized light fixtures that add color or sparkle to the room. Add fabric shades to windows that stand out. Use countertops with dimension, a unique cut or a lot of character in order to bring in an interesting element to the space. Rather than creating a space that is just useful, make it a place you want to be. For example, create a room that is welcoming and inviting. Pay attention to the details. Using cabinetry with ornate detailing is a good place to start. Invest in a higher quality tile for the flooring. Consider choosing an island that is the focal point with numerous drawers – so much so, that it looks more like a dresser than an island. If you stepped into a condominium in a tropical island, what would you want this room to look like? Kitchen remodeling to create a destination space at home makes the most sense. After all, you want to feel welcomed in your home. Ideas you like, a cabinet that would work, a faucet you must have….collect pictures or even use Pinterest on-line to gather you ideas. It helps to sort out later which ideas are most important. Kitchen remodeling can be as extravagant or as simple as you would like it to be. It can be an amazing opportunity for you truly to dive into style trends and sophistication. On the other hand, it still needs to be functional. The combination of both functional and trendy is possible. You will know you will have the ideal space when you work with a professional, so if you’re in Dane County Wisconsin, give Adams Design Construction a call – 608-241-9009 – we’d love to make your dreams come true. Who didn’t fall in love young Harry Potter sitting in his little day bed under the stairs? 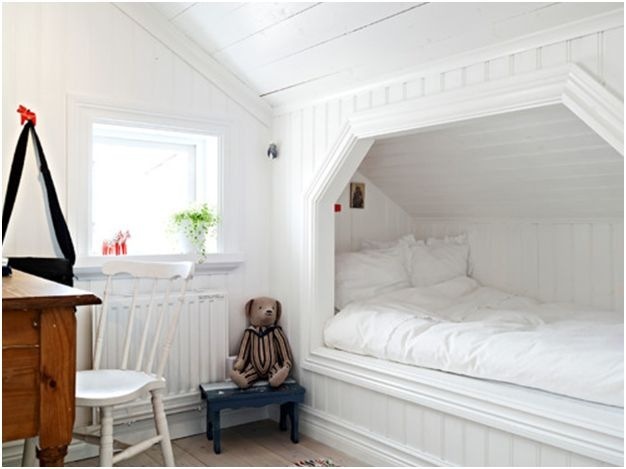 Cute cubby spaces are not just for characters in books and movies! Creating a custom made day bed is one of the creative and economical of ways to add instant character to boring, boxy rooms. It’s a terrific way to use other wise wasted space. It’s a simple, but very effective, focal point to spring board your imagination into action. Having a structure that really serves you, as well as looking great, is the charm of great design. 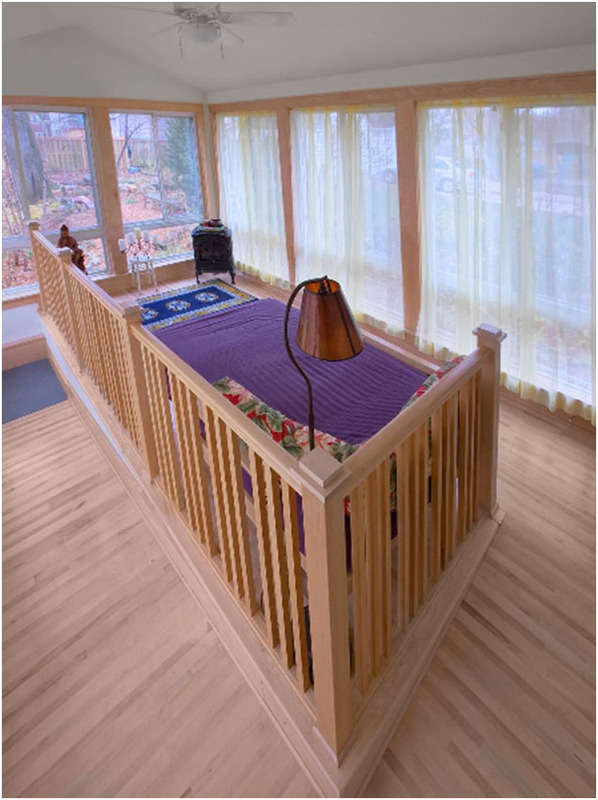 Day Beds can be created to be flush with or just below a window with cleverly flanked shelves. 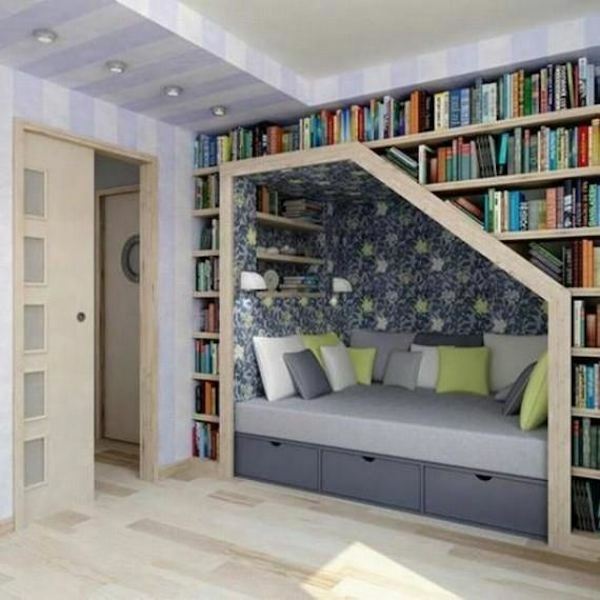 A great parent spot to watch the kids outside while taking a coffee break; two friends can share a private visit; an industrious teenager, will find a handy space to hunker into to study, read, or use cyber ‘toys.’ When your sister comes to spend the night, a perfect place to sleep. 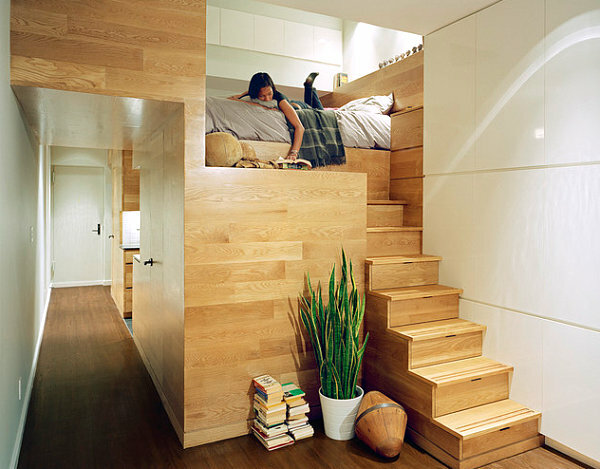 Built in day beds can be constructed low with drawers for storage. Perfect for blankets, toys, rain/winter wear, sports gear, or holiday trimmings. It can easily house yet another bed, to be trundled out for a sleep over or even a cozy place for loved pets to share nap time. 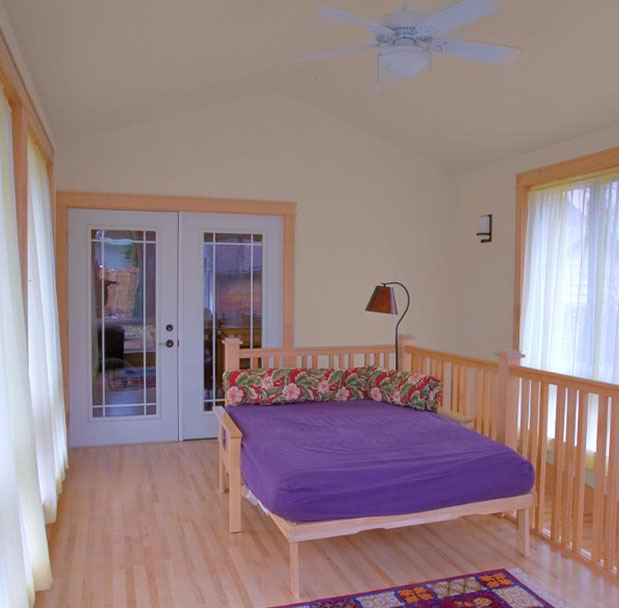 For ingenuous style, a pentagon, hexagon or octagon shape could be cut into a wall to surround and contain the bed. Stylized doors can be created to close off and cleverly conceal the bed. Day beds can easily be constructed to wrap around a corner…two snoozing spots in the sunshine. Outdoors, they can suspend from a porch ceiling or for more joy, built into a deck area and be furbished with wood or fabric over hangs to create a perfect cabana! Need to update your bedroom? Give us a call, we love to help – 608-241-9009, or visit our web sites AdamsOfMadison.com ! As we get older and look around our homes, we may realize there are some items that are either becoming difficult or will become difficult as we age. It is never too early to start planning or making small changes to start to accommodate aging in place. Here are some ideas of items you can change to aid with aging in place, from small projects to more involved projects. One of the easiest things to do is to install some bathroom grab bars. Install in bath units and/or by toilets for safety. Please note, grab bars are designed to take one’s weight and do need to be properly installed. Just screwing into drywall would do no good. As we get older, getting in and out of chairs can start to become difficult. Consider replacing your traditional kitchen table with a counter top height table and chairs. If designing a new kitchen, then adding a counter top breakfast bar would also fit the bill. Do you have a slide in range-oven unit and is it hard on you when you bend to get items out of your oven? Then consider changing to a cook top range and wall oven units. You can then place your wall oven at counter top height or any height that works best for you. The newer energy efficient front load washers and dryers can save you a lot on your energy bills. But just as with the oven, constant bending to load and unload them can become a problem. Consider putting you front load washer and dryers on some risers. Most pre-made risers are around 15″ tall, which will make loading and unloading your front loaders easier on your back. Is your washer and dryer in your basement? Tired of hauling laundry up and down flights of stairs? Consider relocating your laundry room. Move it to the first floor, or if you have a two story home and can find the room, create your laundry room on the second floor near the bedrooms. It’s not such a new idea, but more and more companies are making stair chair lifts. They easily attach to your existing stairs and most fold up for easy access. Stair lifts are a great way to keep being mobile regardless of where your stairs may be located in your home (basement, second floor or even outside). A wet room bathroom is where the shower is integrated in to the bathroom instead of being a boxed off space in the corner. The big difference of course is the level of the flooring. A wet room has no step or tray for the shower area. The floor being a suitable gradient so water drains away and doesn’t flow out right across the entire bathroom floor. Or as an alternative to redesigning your entire bath would be to replace your bathing area with a low entry shower. Thinking about updating a portion of your home, then give us a call, Adams Design Construction, Ltd 608-241-9009, we’d love to help you make your dreams come true! 1) Create an Efficient Workspace – Above everything else, a kitchen is a workspace. And whether you’re preparing a meal for ten or two, it’ll be infinitely easier on you if your workspace is organized and efficient. Typically, while working in the kitchen, you’ll be moving back and forth between three areas: the refrigerator, the stove, and the sink; also known as the kitchen work triangle. Designing your kitchen to optimize this triangle will go a long way to make it a great place to work. 2) Keep it Open – Every kitchen, especially smaller ones, can benefit from having an open layout. Keeping a kitchen open and flowing out into a dining or living room will make it feel way bigger than it actually is. This can be taken even further, by using open shelving instead of cabinets, smaller appliances, and sleeker furniture. 3) Light it Right – Too many kitchens try to rely on a single light in the ceiling to get the job done, when this usually isn’t the best way to do it. Often, a combination of different types of light fixtures, some providing softer, ambient light, and others more focused, is the most effective way to illuminate the kitchen. 4) Air it Out – Those onions tasted great in the dish you just made, but the lingering smell all around your house isn’t so great. Incorporating adequate ventilation into your kitchen design with windows and range hoods will help keep the rest of your home free from any odor, smoke, and moisture created from cooking. Designing the perfect kitchen can be a daunting task, but you don’t need to do it alone! At Adams Design Construction, we’ve been designing kitchens that look and work great for more than 30 years – we know what makes a perfect kitchen. Contact us to make an appointment, and we’ll help you make your dream kitchen a reality. Spring time can also be called Home Improvement time. Step outside and take a look at your home from the curb, or otherwise known as curb appeal. What does you siding look like? Is it time for a siding replacement? Or is the paint on your siding starting to show fading or peeling? Choosing a siding color can be an overwhelming experience. After all, it is likely that you’ll be keeping the same siding color on your home for several years to come. The color of your roof. Your roof color will play an important role in your siding color selection. After all, the lifespan of a shingle roof is around 20-30 years. It may not be a good idea to select a siding color too similar to the roof color. For example, a dark roof and a dark siding color can make the home look dreary and uninviting; on the other hand, a light roof and a light siding color can make the home look too bright and sterile. The size of your home. The size of your home is another factor to consider when choosing your siding color of choice. A larger home may look drab with darker siding since the dark color can be overbearing. However, a larger home shouldn’t have exclusively light colors. It is also important to create contrast. A good idea would be to contrast lighter siding with dark accents, such as the shutters. Plus, since dark colors grab your eye, we suggest including dark colors in accents or places where you want to catch the viewers’ attention. The architectural style of your home. What’s the architectural style of your home? Often, different home styles are known for different siding colors. For example, Colonial style homes often have white siding and Craftsman style homes are known to have darker siding colors, such as sage. However, don’t be afraid to bend the rules…well, to an extent. To give an example, a home style that is known for white siding might look attractive with light gray siding. The subtle shift of color is unexpected and fun, without looking to out of place. In addition to these tips, it is also a wise decision to avoid a siding color that is too trendy. After all, the siding that you choose is a huge investment and cannot be easily changed – no matter the material you choose. If you want to include a trendy color, it is best to include it in accents that are easier to swap out. This can be in items such as entry mats, planters, and the like. That way, it is simple to swap pieces out when you grow tired of that color. In conclusion, choosing a siding color for your home can be an exciting yet overwhelming experience. Don’t be afraid to try out some sample colors on your home first. Need help, Adams Design Construction are always happy to help, so give us a call if you’re in Dane County, WI 608-241-9009, or visit our website Adamsofmadison.com. We’d love to hear from you.